Slide: 1 / of 1. Caption: Snap Inc. 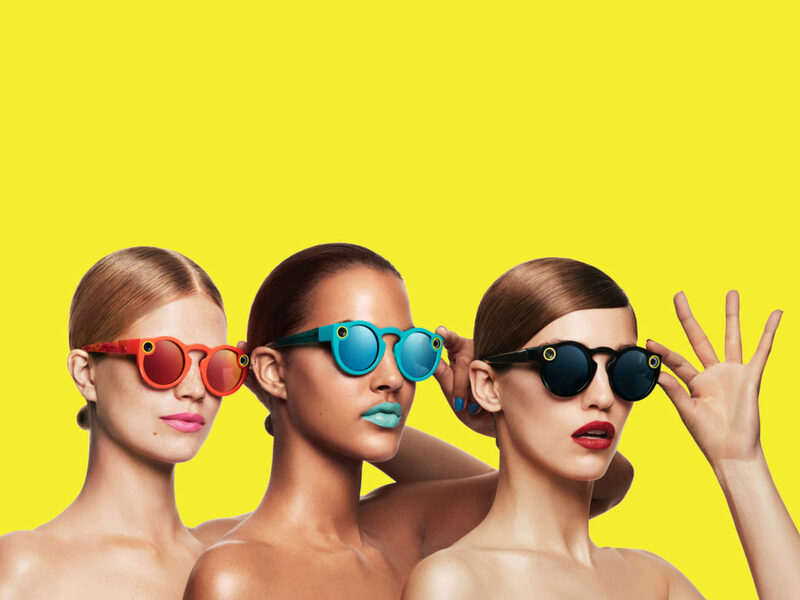 The story of Spectacles, the new camera-filled sunglasses from Snap, goes back further than you think. It begins probably well before you were using Snapchat, even before Google launched Glass and ignited the face-camera firestorm Snap would learn so much from. It starts with a company called Vergence Labs, and a product called Epiphany Eyewear. Camera lenses seem to be poised to reinvent computing the way the keyboard and mouse once did, or the touchscreen after that. Sounds familiar, right? It should. Snap purchased Vergence Labs for a reported $15 million in 2014, and put the team to work building what eventually became Spectacles, the company’s new photo-shooting sunglasses. Today, Rodriguez’s LinkedIn page calls him “Spectacles Co-Founder / Architect.” (Miller left Snap six months after the acquisition and is now a venture capitalist.) Spectacles look a little wackier than Epiphany Eyewear, and upload to Snapchat instead of the YouGet.TV site the Vergence guys developed, but the idea is very much the same. Vergence understood the same thing Snap does: that as cameras get more plentiful and more powerful, they’re going to be more than tools for capturing pretty pictures of the Grand Canyon or your epic latte art. Cameras are going to be eyes through which our computers can see the world, and through which we can see each other’s worlds. When it’s clearer than ever that we need to do more to understand each other in deeper, better ways, seeing even ten seconds of someone else’s view might be important. Late last week, Jesse Wellens was asleep in his Venice, California apartment when he got a call from his friend Andy Milonakis. “He was like, ‘Hey,’” Wellens remembers, “‘Did you know there’s a vending machine on the boardwalk?’” Wellens, whose YouTube channel PrankvsPrank has more than 10 million subscribers and who published a daily vlog for more more than six years, had been excited about the idea of Spectacles for a while. “I’ve always had a couple of spy sunglasses that had cameras in them, because I do pranks,” he tells me. “The quality was always bad, and they always looked really obvious that they were camera glasses. These, they look like an Oliver People’s thing.” Wellens skateboarded over to the vending machine, offered the next person $500 for their extra pair, and walked away with some Spectacles. A few days later, Wellens published his first vlog in a while, shot entirely in the 10-second, circular Spectacles format. He says it felt different from any other episode. Before, he says, “I would film myself and other people, but when there are cameras out, you always get a different reaction from other people.” But with Spectacles, “You’re getting a real, inside look into someone’s life. This is a way that you’re getting real raw emotions, and interactions.” He only had to make one alteration to get there: he stuck a round piece of electrical tape over the spot above his left eye, where Snap put a spinning circle of LEDs that indicates the wearer is taking video. When Spectacles first launched, Snap CEO Evan Spiegel told The Wall Street Journal that he saw Snapchat as an activity more like texting and less like capital-p Photography. “People wonder why their daughter is taking 10,000 photos a day,” he said. “What they don’t realize is that she isn’t preserving images. She’s talking.” The core value of Snapchat, which has never been so important in a time when everything on the internet is saved and combed over and used to cause us trouble, is that it has fewer consequences. You don’t have to worry about what you post, because it’s gone in a few seconds or hours. By making that communication a one-step process—just click the button—Spectacles remove another core bit of friction from the experience. Which makes people think less, and talk more. Which is exactly what Spiegel seems to want. Cameras are going to be eyes through which our computers can see the world, and through which we can see each other’s worlds. In the week I’ve had Spectacles, I’ve shared dramatically more on Snapchat than I ever have before. It becomes unconscious, almost: you just see something cool, and tap the button to save it to the log. Not only does having these unobtrusive glasses make it possible to get new kinds of shots, it makes it easier to capture the ones I’d want anyway. And since it’s such a monumental pain to get Spectacles video out of Snapchat (which the conspiracy theorist in me wants to believe was on purpose), most things just stay there. Good camera lenses are cheap now, which means they’re about to be everywhere. High-level image recognition is what makes augmented reality possible at the level Magic Leap and Microsoft Hololens hope to operate, and it’s what Snapchat already uses for its filters and lenses. “The camera is the composer,” Mark Zuckerberg told Facebook employees recently. Filming is replacing typing. The best hint for what Snap in particular might be planning comes from that very same Vergence Labs StartX application video. In it, Rodriguez holds up a matte black visor that looks a bit like 24th-century armor. He excitedly describes the Android-powered system he built, which uses computer vision and his Facebook account to figure out who he’s looking at. The goal was to “redefine the future of face-to-face interaction.” It was just a prototype, but it was the endgame. Not long after that, Rodriguez posted a now-deleted answer to a Quora question titled, “Will augmented reality products like Google Glass and Epiphany Eyewear make phones become obsolete?” He talked about adding displays that can show text and images, supporting eye-tracking and mind-reading, and eventually building glasses that can render true augmented reality. “We’re some serious R&D away from this future,” he wrote, “but it’s doable and will happen.” Add in a vending machine and a dose of Ghostface Chillah, and you might not be far off.